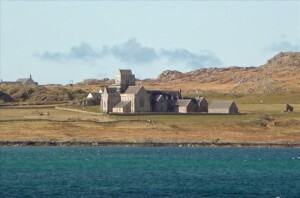 St Columba and his twelve Irish followers founded a monastery on Iona in CE 563. This became the heart of the early Scottish Church, and an influential centre for the spread of Christianity among the Picts and Scots, and is one of Scotland’s most historic and sacred sites. 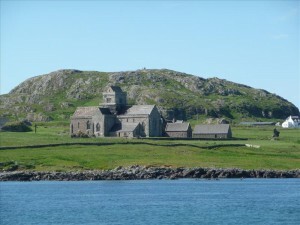 St Columba’s fame attracted pilgrims to Iona from the 7th century onwards. 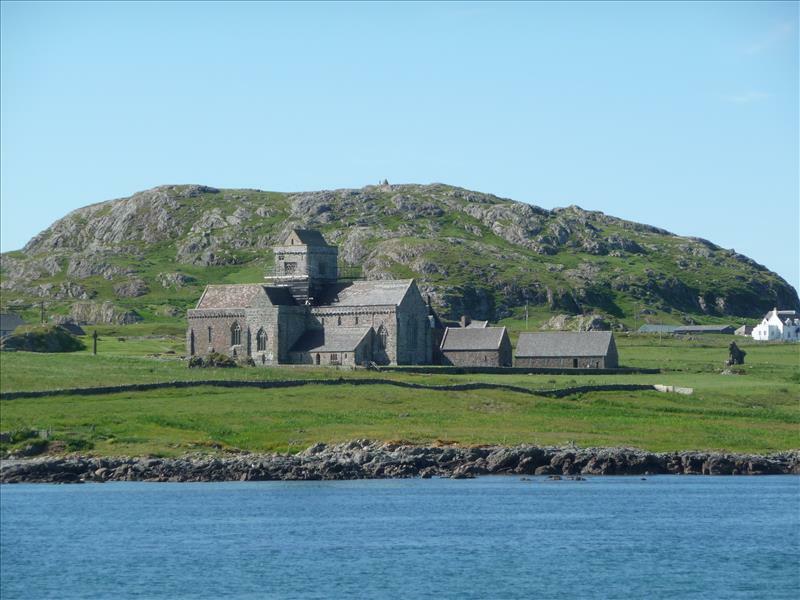 As a celebrated focus for Christian pilgrimage, Iona retains its spiritual atmosphere and remains an enduring symbol of worship. Such was its influence that the island also served as a burial ground for important and holy people from near and far. These are said to included kings of Scotland, among them Macbeth, who died in 1057. As many as 48 early Scottish kings, and kings from Ireland, Norway and France are said to have been buried in the Abbey Graveyard, Reilig Odhráin, the small cemetery containing St Oran’s Chapel that is sited beside Sràid nam Marbh, ‘the street of the dead’. However, modern scholars are sceptical of such claims, suspecting that they might have been invented to enhance the Iona’s image. The island is the resting place of numerous leading Hebrideans, such as various Lords of the Isles and other prominent members of West Highland clans, including several early MacLeod chiefs. The politician John Smith, Leader of the Labour Party, who greatly loved Iona, was buried here after his sudden death in 1994. It is believed that the famous illuminated manusript, The Book of Kells, which is now on display in Dublin, was produced by the monks of Iona a little earlier than 800, and The Chronicle of Ireland was produced at Iona until about 740. All that now remains of Columba’s original monastery is the great vallum, the enclosure bank that surrounded the holy site, and Tòrr an Aba, ‘hill of the abbot’, where Columba is believed to have died in 597. The little stone building called St Columba’s Shrine, beside the door leading into the later abbey church, may date from the 9th century. Columba’s monastery was repeatedly raided by the Vikings. Thirty-eight monks were massacred in 805 and, following this, Columba’s monks returned to Ireland to a monastery at Kells, and others fled to the Continent to establish monasteries in Belgium, France and Switzerland. St Blathmac and other monks had returned to Iona, but were martyred in a raid in 825, when the Abbey was burned. As a result, late in that century, Columba’s relics were taken for safekeeping to Dunkeld in Perthshire, and to Kells. However, it is thought that the Abbey wasn’t completely deserted, as is evidenced by the death on Iona in 980 of a retired king of Ireland, Amlaib Cuaran, indicating that Iona still retained considerable importance. After having been seized by the King of Norway and held for fifty years, Iona was recaptured by Somerled, ‘King of the Isles’, who then invited renewed Irish involvement in 1164. As a result, the central part of the Cathedral was built and Somerled built St Oran’s Chapel as a family burial place. Subsequently, in 1230, his son, Ranald (Reginald), ‘Lord of the Isles’, re-founded the old monastery as a Benedictine abbey on the Columban foundations. The new Abbey church was built on the site of Columba’s original church. It was dedicated to St Mary the Virgin and built on a cruciform plan. The cloister was to the north of the church, the chapter house centrally placed along the east range, and living and dining areas above it and in the north range. Ranald also established Iona Nunnery, an early Augustinian nunnery, which was built south of the Abbey buildings. The remains of this complex are one of the best examples of a medieval nunnery left in Britain. The grave slabs of some of the early nuns remain, including that of a remarkable Prioress, Anna Maclean, who died in 1543. Her grave slab lies in the Chancel of the Nunnery Church, but is badly damaged. Clearly visible under her outer robe is the ‘rochet’, a pleated surplice denoting the Augustinian Order. The Nunnery buildings were rebuilt in the 15th century and fell into disrepair after the Reformation. The Abbey church was substantially expanded in the 15th century, but the monastic life came to an end at the Protestant Reformation in 1560, when the Abbey was dismantled and abandoned, and its monks and libraries dispersed, as was the case with numerous other abbeys throughout the British Isles. It was briefly revitalised by Charles I in the 1630s as the Cathedral of the Isles, but faded into oblivion when bishops were abolished in the Scottish Church. It again re-emerged in the 1870s, when the 8th Duke of Argyll began restoring the buildings. It was substantially rebuilt and restored in 1899 after the original Benedictine Abbey and associated buildings were gifted to the Church of Scotland by the Duke of Argyll. A new era began in 1938, when the Rev. George MacLeod inspired a group to rebuilt the Abbey and found the Iona Community, which also re-built the surrounding buildings during the 20th century. The buildings have been restored in stone and slate to reflect their monastic origins and the Abbey Church retains many medieval features. The contemporary, Jedburgh-based sculptor, Christopher Hall, worked for many years on carvings on the cloisters, which represent birds, flora and fauna native to the island. He also carved John Smith’s gravestone. Today, the restored Abbey Church and cloister are in daily use, and the Iona Community (ecumenical) continues the tradition of worship first established by St Columba 1450 years ago. Four 8th/9th-century crosses provide tangible links to the strength of belief that led to the founding of Iona as a centre of Christianity so many years ago. The 8th-century St Martin’s Cross still stands by the roadside, and a replica of St John’s Cross stands by the doorway of the Abbey. The restored original is in the Infirmary Museum at the rear of the Abbey.